Join us for our bi-annual excursion to the great outdoors! 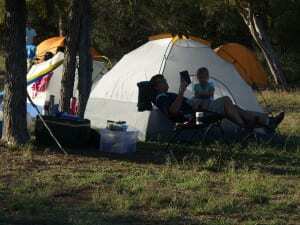 We reserve the Youth Campgrounds at Pedernales Falls State Park for our use, so please come out and participate in a way that is manageable for your family. 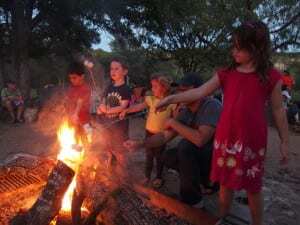 Spend the night, come for the day on Saturday or join us on Saturday evening for our community pot luck and singing around the campfire. You will be so glad you made the effort as soon as you step out of your car – it is an enchanting place! Check out this FLYER for quick reference for all the details below. Visit Pedernales Falls State Park website for more details about the park. We do a great job of reducing our footprint on the planet while at school and carry our values with us to Pedernales Falls State Park. In general the rule is: You Bring It, You Leave With It. 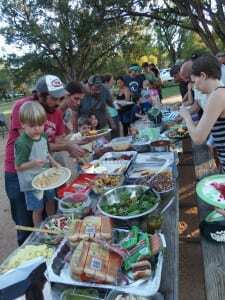 We ask that everyone help us clean up after our potluck and ask all campers (day and overnight) to make a sweep of their camping area ahead of our sing-a-long.